Made to be quick and maneuverable with the 5th Element ST-80 Urban Inline Skates. You will be able to snake through obstacles on the streets and through the park. The 80mm wheels with an 84A durometer add to the perfection of these skates in an urban setting. If your playground is the concrete jungle then these skates were made for you. These skates feature a rockered frame which has two wheels lying flat which gives the ST-80 better cornering ability which will make it easier to turn and maneuver. 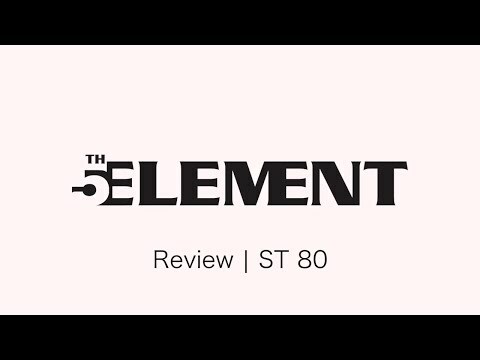 The 5th Element ST-80 skates are quick and comfortable and are a great skate for navigating the concrete jungle. Quick and Maneuverable - Snake through obstacles in the park, on the street or wherever else you choose to play. Durometer & Wheels Made for the Street - 80mm wheels and the 84A durometer are designed to be skated in an urban setting. Lightweight Frame - Aluminum frame is less fatiguing on your feet, so you can spend more time in the concrete jungle. Stability and Comfort - The ratcheted ankle strap and rockered frame provide stability and comfort for strenuous skating. Traditional Lacing System - Makes getting out and skating a breeze, while offering a customized fit for comfort. California residents: Please click here to review the Proposition 65 warning related to this item. WARNING: This product may contain chemicals known to the State of California to cause cancer and birth defects or other reproductive harm. Great bang for the buck!. In my younger days on half pipes & skate parks, I'd have wanted much more in a skate. But now I just skate to run my dogs on the greenway. These skates are perfect for that. I changed the center wheels to 76mm to eliminate the rocker & that has worked fine. You know you're not getting a super high end skate here. But they're fine for 95% of the population for simple recreational skating. Q: Are these sizes in men sizes? I wear a size 8 in women shoes and wore a size 6 in men's inline hockey skates. A: No, these skates fit the same as shoe size so you want to go with the size 11. Skates can take up to a handful of skating sessions to fully break in so you should expect a tight fit out of the box. Q: How much higher are the middle two wheels rockered? If you wanted to "unrocker" them by putting two smaller sized wheels in the middle, what size would they have to be? 76mm? And would that even be possible? A: It's a matter of mm's for sure but I'm not sure exactly what the measurement is, I don't think it's as drastic as 4mm so 76mm would likely not work. I don't think there really is a way currently to not have these skates be rockered without swapping the frame. Q: Looks like the skate does not come with a brake stopper at the rear. Can one be fitted? A: There is no brake on this skate and at this time no brake assembly is available for this model. Q: can these skates be used indoor also? A: Yes, the ST-80 will work well indoors and out but if you skate outdoors then skate indoors you could see issues as the wheels tend to pick up dirt and debris when skating outdoors that can make the wheels more slippery indoors, and some rinks will not allow for wheels that have been used outdoors for this reason. I always recommend 2 sets of wheels if going from indoor to outdoor often. Q: I'm a size 7 in women's, would the size 6 in men's fit me on these skates? I heard that men's skates are often a bit wider since the foot shape could be different. A: These skates will fit you in a size 6 if you are 7 in womens. A: These skates are going to fit very similar to your everyday shoe size so the size 9 should be good for you. In some marathon or race inline skates it can be advised to drop a size or half size but in hard shell skates like this ST-80 the same as shoe size is the way to go. Q: What is the width on the size 11? I tried several skates and most of them are too tight on the sides of my arch. My best fit are Fitness Roller skates but I hate how they look. I want something more aggressive look . A: Width on all inline skates tend to be fairly standard and no company currently makes a skate with a wide width. The hard shell urban skates are going to tend to feel a bit more narrow just due to the nature of their design. I would recommend selecting a skate based on the type of skating that you are doing, if you are doing just recreational and fitness skating a rec or fitness skate will be best, and many are looking much nicer aesthetically. Skates like the Rollerblade Macroblade and K2 FIT series for 2018 feature a sleek dark finish, and the K2 Uptown has the finish of a K2 softboot aggressive skate with an urban frame so you could use that for many types of skating. Q: I'm looking to get into riding skate parks and doing tricks is this a good durable skate to start with? A: This is a great skate for urban skating around the city, but is not ideal for strictly park skating for tricks. For doing tricks a skate like the Rollerblade NJ5 will work best as this has a specific design with area for grinding obstacles and a lower to the ground design for more control on ramps, bowls, and for when landing off obstacles. Q: if my feet size is 28cm, What size should I order? A: 28cm equates to a size 10 US shoe size which is the size that would be best in this skate for you. For a limited time, sign up for our emails and get 10% off your first purchase. You'll also receive product sneak peeks, exclusive offers, and upcoming events. *Excludes select brands and special order products. Cannot be combined with any other offer. Questions, problems, or testimonials about our website, policies or service. We want to know.